Dubai aims to create an oasis that covers more than 10 percent of its land with saltwater rice developed by Chinese researchers and then expand out to the rest of the Middle East and North Africa. The Qingdao Saltwater Rice Research and Development Center, led by China's "father of hybrid rice" Yuan Longping, is trying to breed saline-tolerant rice varieties adapted to Dubai's climate, together with a plant protection system that uses sensors and big data technologies. The surface temperature of Dubai can reach 54 C between June and July, the temperature in one day can swing over 30 C, and there is salt water with a salinity of 1.6 percent seven to right meters under the desert. "We are choosing the most suitable breeds for Dubai from more than 80 varieties," Zhang Guodong, deputy director of the center, told the Global Times. The saltwater rice varieties that the center has developed can grow with 0.6 percent saline water. Seawater is saline up to 3.5 percent, Zhang said. The first batch of mature rice yielded in Dubai in May has a maximum yield of 7.8 tons per hectare. The agricultural cooperative project of growing saltwater rice in the United Arab Emirates (UAE) is promising, as the country mulls shifting its oil-based economy to other industries, Yin Gang, a researcher at the Institute of West Asian and African Studies at the Chinese Academy of Social Sciences, told the Global Times. If the UAE project is successful, the technology could feed the entire Arab world, Yin said. UAE Vice President and Prime Minister Sheikh Mohammed Bin Rashid Al Maktoum, the ruler of Dubai, personally named a saltwater rice souvenir "Al Marmoom," to commemorate the successful test of the first batch of rice. It will be presented to distinguished guests as a future "national gift," according to the center's statement. 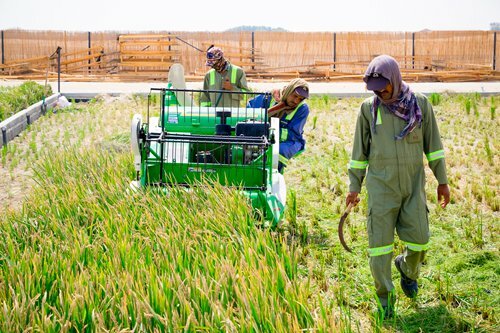 A 100-hectare saltwater rice experimental farm is going to be launched in the Dubai desert in 2019. The farm will be funded by commercial investment, including capital from China's Belt and Road initiative. The UAE also agreed with the center to establish the Yuan Longping Middle East and North Africa Salt Water Hybrid Rice Research and Promotion Center, which will promote rice growing technology in the Middle East and North Africa.